So yeah, I was here. Although Superman had to go back to work on Monday, I got to hang out in Charleston for a few more days. Mary Claire left for work early in the morning, which left me to my own devices. What to do…what to do…. After a circuitous route from downtown to the other side of Mount Pleasant (a 30-45 minute drive) back to West Ashley (another 30 mins) looking for drawer pulls, I ended up having lunch with this handsome fella. 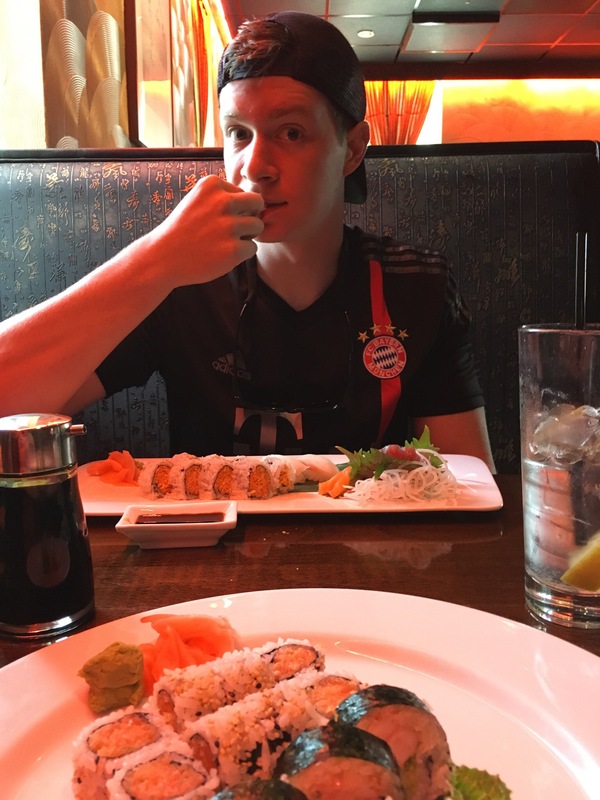 During high school, whenever Adam had the day off of school, he would ask if I would like to go out for sushi. (I’m sure he was just looking for a free lunch, but I appreciate that he asked for my company instead of a $20 bill.) Lucky for me he had the day off from carrying luggage and shuttling guests to and fro, so we spent the afternoon eating, shopping, talking and laughing. The boy is beginning to realize how expensive it is to feed a healthy growing 21 year old. He said the last time he went to the grocery store his bill was over $60. We hit up the local Bi-Lo to load him and his sister up on on food and paper goods. MY bill came out to be over $200! Having two of my kids in the same town, I HAD to make them a special dinner. When asked what they would want me to cook, they both replied simultaneously “Meatloaf!” That always cracks me up. Meatloaf. Easy enough. This makes my heart full…Momma’s meatloaf, green beans from my garden and roasted potatoes with some of my favorite people. I get teary eyed thinking how blessed I am having a family that wants to be together. Tuesday brought a day of happy moments. First off, I received a message from my friend, Zina, that instead of 12-15 gals coming to a church gathering at my house, 35-40 were signed up! When I left Spartanburg on Sunday, 12 of us could hang out in the basement, so I only focused on that area. Thirty-five to forty presented me with the task of upping my hostess game. I needed a few gifts to be given away during the gathering. Life way Christian Store at Northwoods Mall seemed like the perfect spot. Of course I couldn’t look up the address and go straight there. Nope! Ol Mar thought it was near the outlet shopping center. I drove north on the highway for a couple of miles to see that I was going the wrong way to the outlet shops. I turned around at Rivers Avenue and drove the six or so miles south to the outlets. Guess what! Northwoods Mall is not there. It is off of Rivers Avenue!! Back to the highway to go where I came from. I bought a couple of sweet gifts for the women’s gathering. Then I saw this amazing sight! I mean, I’m sad to see a store going out of business, but for me-a crafter, sewer, lover of all things colorful and fun….Everything must go! 50-60% Off! I had to do it. Not only did I buy the obvious fabric, thread and notions, but I got my hands on two metal basket like shelves that you hang on a peg board. Do I have a peg board in my craftroom? Nope, but I have big plans for that room. Big Plans. Time for lunch! My girl took me to Gaulart&Maliclet, otherwise known as Fast & French. It was D-Lish! And you know what made it even better? My adult, married, working daughter paid for our lunch! I think she may be all growed up. We hugged and said good-bye. She went back to work and I stood there practically jumping up and down in the middle of King St. as I realized I was all by myself to do whatever I wanted to do in my favorite city! Yippee Skippee!! If you’ve ever been to Charleston, you’ve seen the little boutique shops that are hidden up a flight of stairs. And if you’ve ever been shopping with the Higgins guys in tow, you know that you will never go up those said stairs to see the cuteness that awaits you. Just sayin…But not today!!! Today I am free and by myself! 218B King St. Here I come! I mean seriously…how can I not go up?!? At the top of the stairs I hung a right into this adorable little shop, Texture Design Co. Colorful, clean graphics designed and created by a darling talented young woman, Emily Kirby. She sells her prints, cards, calendars there at the shop or you can find her beautiful artwork at her Etsy shop. Need invitations? Contact this gal. Maybe you’d rather have something a bit more personal. Why not a portrait of your home or of your college? I have a few ideas in mind myself. Isn’t she the most adorable thing you’ve ever seen? Let me tell you, her beauty isn’t just skin deep. Her love for God radiates from her. Emily and I talked for a long time about her life, my life, and the creative life. After buying a few cards, I mosied on across the hall and met this cutie-patootie. (This is Ashley or it could be her business partner Ashleigh.) 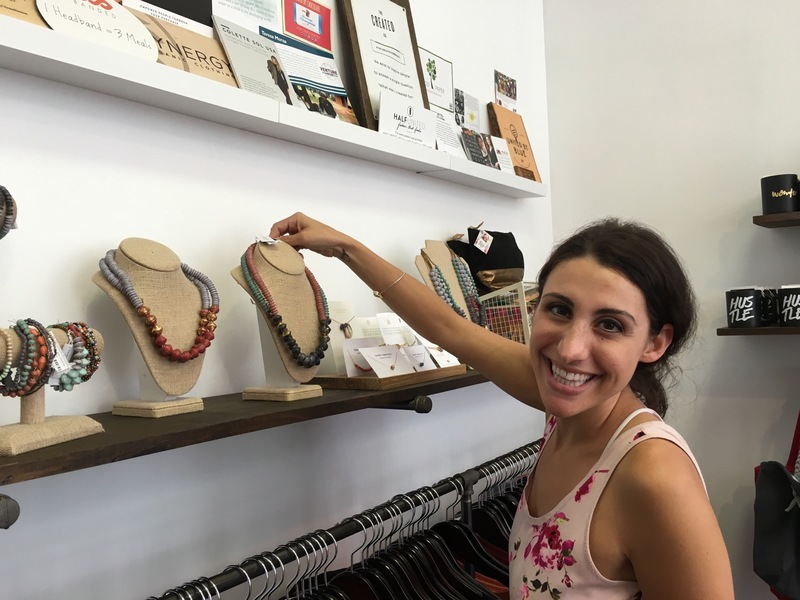 She is part owner of Be The Change Boutique. Now we all buy stuff. Why not shop with a purpose? The purchase of the earrings above help a student go to college. The clothing that Ashley is standing by removes one pound of trash from the world’s oceans and waterways. Cool! Each headband provide 3 meals for a child in Uganda through Amazima Ministries. Their Rescue Chocolate is “the sweetest way to save a life!” From each chocolate purchased, 100% of the net profits are donated to animal rescue organizations around the country. 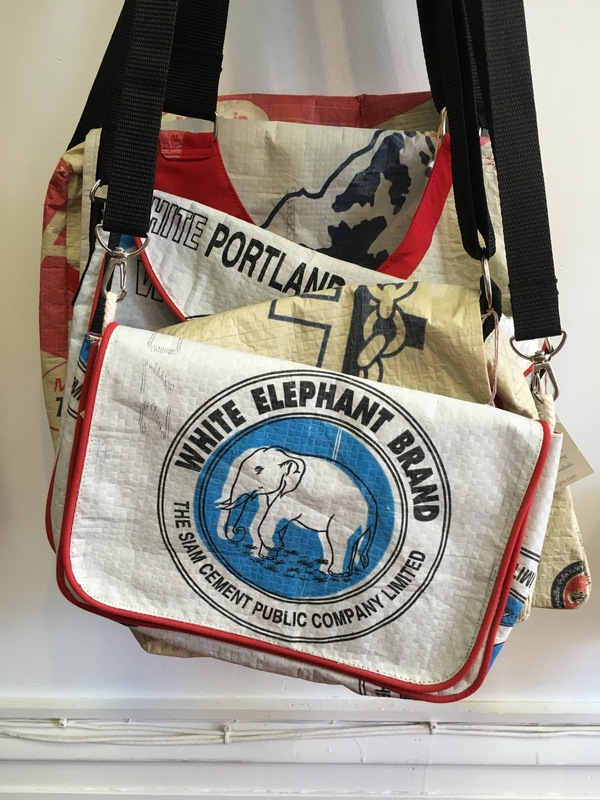 This bag supports the stopping of human trafficking. Handmade beautiful paper beaded jewelry made by 31 Bits Daphne of Uganda uses fashion and design to empower people to rise above poverty. I bought this necklace, which will not only look pretty around my neck, but will also feed a child for a week. Nice. It was such a joy to listen to her passion for helping others. We shared what it’s like to sometimes wonder if what we are doing is worth it. Does it make a difference that we’ve taken a leap of faith and opened a store or spend hours writing a blog post? We decided that for every hour with no customer or having that customer who doesn’t “get” it or having silence that follows a posting, there is always that one. There is that one person who walks in the shop and wants to know about every product. On that day that you have decided to shut it down, you’ll receive a message from someone whom you don’t know at all or someone you haven’t heard from in years to tell you that what you’ve just written has made their day. And that my friends makes it all worth it. As soon as I walked down the stairs from my newest discovery I texted Mary Claire to tell her I made two new best friends. She replied “Two puppies?” Ha! She knows me well. Nope, I told her, they are of the two legged kind. Mary Claire and I had made plans to watch a movie that night. 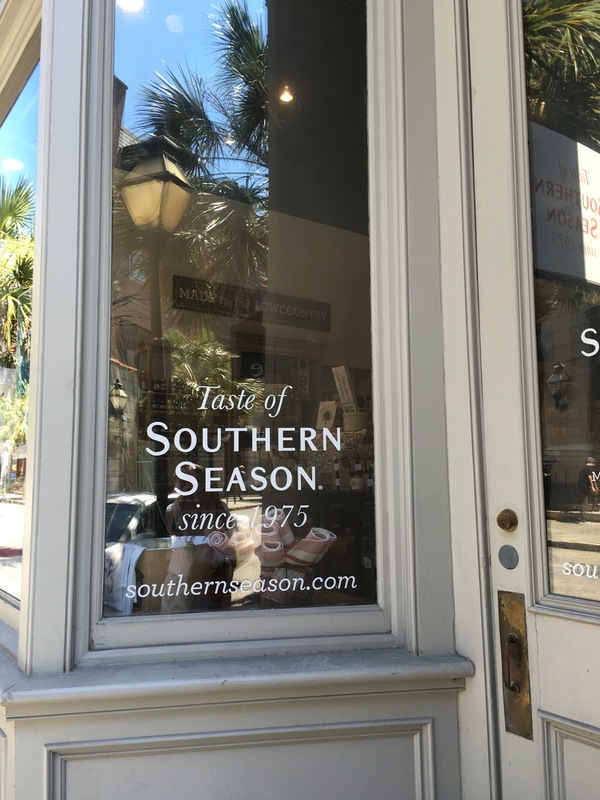 Walking toward the market I saw another little gem,Southern Season. I was sure I could find us some movie treats. Need a gift to take to take home? 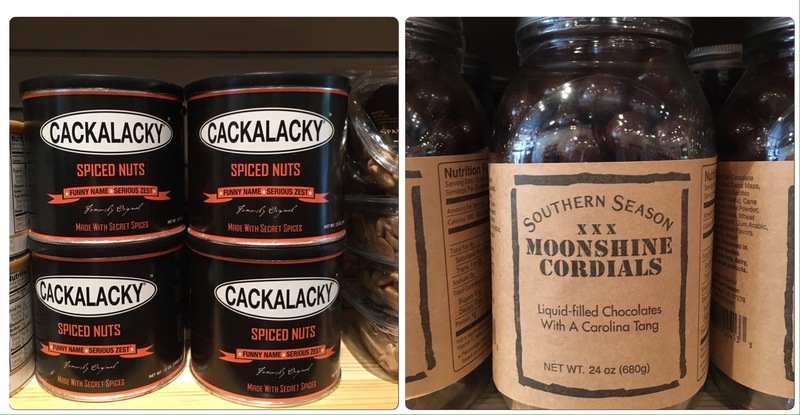 How about some nuts from good old Cackalacky or some Moonshine cordials? I decided on a mixed bag of malt balls, fancy chocolate covered goodness and these Pecan Peachies. Oh My. These little cookies were A-Ma-Zing! Yum. When I was getting my goodies rung up I told the ladies I thought that it was time for ice cream. The lady who took my money said “No honey. 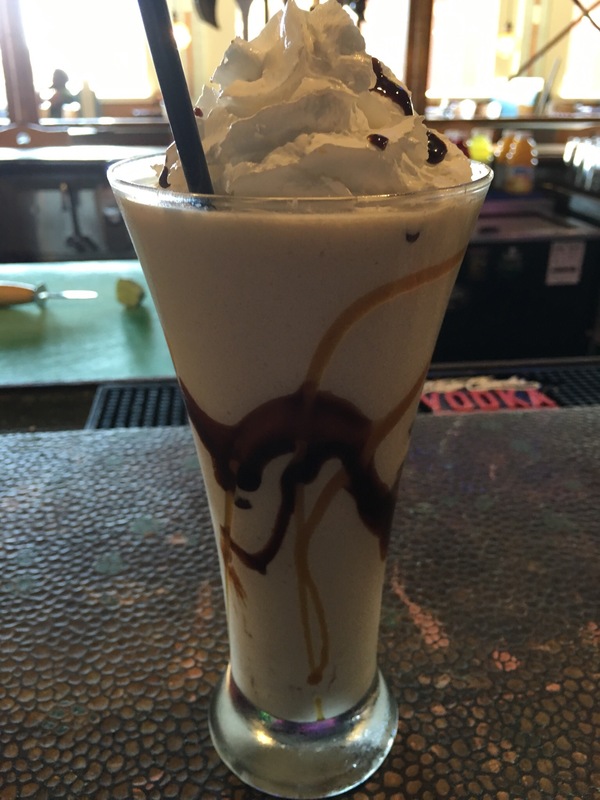 What you need is the adult ice cream Sunday at the Noisy Oyster.” Oh ok. If you say so. I walked through the mandatory tourist attraction, The Market, and made my way to the Noisy Oyster. I bellied up to the bar and placed my order. Now, for some ladies, being at a bar by yourself may be a bit uncomfortable. But for me, I was having an absolutely awesome day. Within minutes a young attorney sat beside me. She was grabbing a bite during a break of her deposition. We started chatting. Then moments later, a couple sat down on my other side. They were in Charleston celebrating their 40th wedding anniversary. As they enjoyed their steamed oysters, we talked as if we were long lost friends. Absolutely delightful. It was 5:00 and my girl was getting off work. I paid my tab and said good-bye to my new friends. Of course we hit a few stores for some clothes shopping, but eventually got hungry. Mary Claire took me to a small eatery she’d been wanting to try. After seeing the prices of the wine list and the weak offerings of food, we decided to go to one of our favorites, Barsa. We found a table outside under the little white lights, ordered glasses of wine and a few delicious Spanish tapas. We didn’t leave the restaurant until late in the evening. We had too much to share and didn’t want our time together to end. I needed to leave early the next morning to get my house ready for a whole bunch of ladies that were coming over for a church gathering. This mini vacation renewed my spirit and energy. I was in one of the top 10 places in the US to visit, but what made it so special to me was the people. My kids, Mary Claire and Adam, filled my love tank. The new people I met during my day were kind, funny and inspiring. People. God made us to be relational beings. As much as I do need to clear my calendar of extraneous activities, I must keep people and relationships in the forefront of my life. I hope you will have the opportunity to have a mini vacation soon. Seek new places, make some new friends and enrich the relationships closest to you. 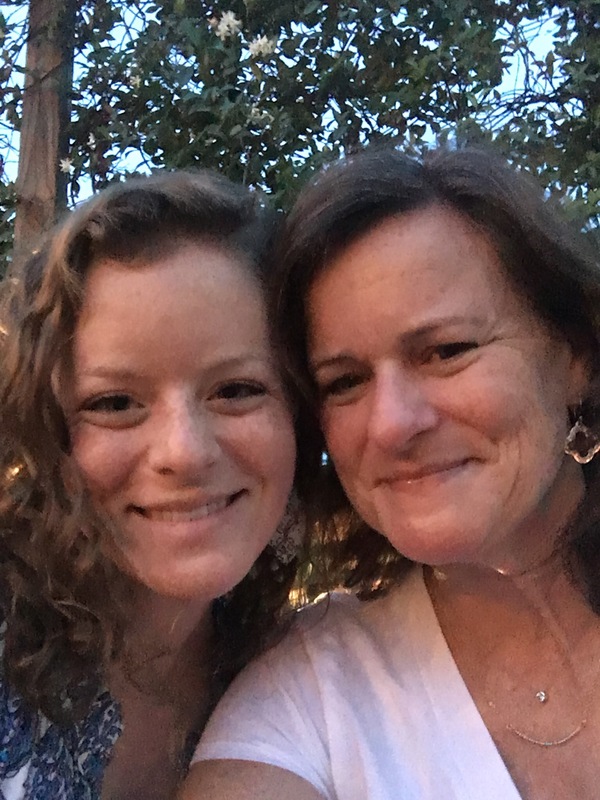 Posted on June 25, 2016 by mary •	This entry was posted in joy, Travel and tagged Charleston, Family, shopping. Bookmark the permalink.